Two weeks ago, a vigorous debate was generated by the Supreme Court’s confirmation of a decision striking down the Department of Conservation’s plan to swap conservation land for private land to facilitate construction of the proposed Ruataniwha Dam in Hawke’s Bay. Much of this debate centred on whether biodiversity gains can be achieved through such trades. Conflicting claims were made about the merits of this particular swap, the broader need to use such land exchanges to deliver biodiversity benefits, and the need for legislative change to allow greater freedom for future land swaps. Unfortunately, some of this debate drew on a simplistic understanding of the requirements for delivering biodiversity gains. Some argued that the proposed Ruataniwha swap must be delivering gains because more land was being offered to DOC than the area of land to be relinquished. Others, however, argued that this was a patsy swap, providing no gains, while facilitating a development project that would, in turn, cause further biodiversity losses in lowland rivers and streams. Can we realistically value biodiversity? One way to evaluate these contrasting views is to view biodiversity trading through the lens of conservation science, which takes us beyond simple comparisons of ‘area lost’ versus ‘area gained’. In particular, this allows any proposed biodiversity exchange to be evaluated more objectively, based on the relative biodiversity value of different pieces of land and how they contribute to New Zealand’s broad goals for biodiversity conservation. These goals are clearly set out in The New Zealand Biodiversity Strategy, a document produced in 2000 to meet New Zealand’s obligations under the United Nations 1992 Convention on Biological Diversity. Goal Three of this strategy is particularly relevant to the current biodiversity trading debate. This identifies our need to ‘maintain and restore a full range of natural habitats and ecosystems…’ and to ‘maintain and restore viable populations of all indigenous species…’, acknowledging our responsibility as global citizens to protect a full range of the biodiversity features that make New Zealand such a unique place. This goal immediately provides a currency by which to assess the potential conservation value of any piece of land, i.e., how much do the ecosystems, and the species they support, contribute to our goal of protecting a full range of New Zealand’s biodiversity? In practice, this requires at least some knowledge of both the current and likely historic distributions of New Zealand’s ecosystems and species. Analysis of such information makes it clear that some places have very high biodiversity values because they support ecosystems or species that are naturally very restricted in their distribution; protecting any surviving examples of these ecosystems is critical to the achievement of our national biodiversity goals – if they are lost, they are gone forever. Examples include the ultramafic Surville Cliffs in Northland that support a number of plant species that only occur on its highly infertile soils, or the coastal turfs that occur at a limited number of coastal sites, and which support a number of species that occur only in conditions of extreme salt exposure. By contrast, other sites can have high values because the ecosystems that they support, though once widespread, are now greatly diminished in extent; the few surviving examples of these provide the only remaining opportunities to achieve our goal of protecting a full range. 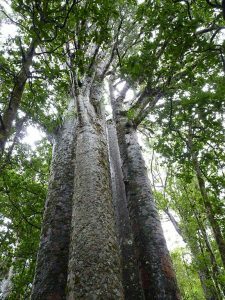 For example, the Waipoua Sanctuary is widely recognised as providing the best surviving examples of the majestic kauri forests that once dominated the northern North Island landscapes. A less obvious example is provided by the very few surviving primary forest remnants on the Manawatu Plains, which are our only means to provide representation of the once extensive forests that occurred there prior to European settlement. This approach, based on assessment of the contribution that sites make to the protection of a full range of ecosystems and species, provides a much more evidence-based means to assess the value of a land swap, than simple, area-based comparisons. Two examples of the robust application of this approach are documented in the Parliamentary Commissioner for the Environment’s recent report on DOC’s management of stewardship land. In one, a small area of stewardship land with low biodiversity values was exchanged to facilitate expansion of parking at Kerikeri airport, with DOC receiving in return land that brought significant biodiversity gains by way of increased protection of rare gumland vegetation, including habitat for two threatened species. In the second, a one ha block of fenced pasture in Nelson/Marlborough was exchanged for a larger area of native forest that increased the representation of alluvial forests not well represented on public conservation land. By contrast, applying these principles to the proposed Ruataniwha land swap immediately raises questions about its potential biodiversity gains; the area to be relinquished contained a complex range of riverine habitats, including primary forest remnants and an oxbow wetland; the land to be received in return, while of much greater extent, mostly consisted of reverting farmland on hill country. 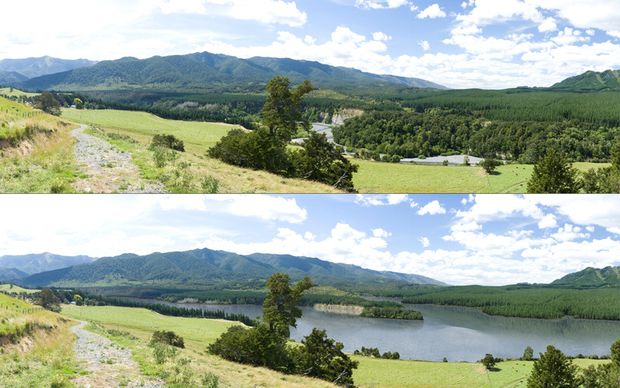 An artist’s impression of the Ruataniwha dam before and after/Isthmus Group. However, any assessment of the relative biodiversity value of these blocks also needs to be informed by an understanding of current and contemporary biodiversity patterns in the Hawke’s Bay, and how well different biodiversity features are represented on public conservation land. This broader context indicates not only a disproportionate loss of the historic riparian forests of Hawke’s Bay, but also that hill-country forests similar to those that once occurred on the land offered to DOC are already well represented on public conservation land in Hawke’s Bay. Once these factors are taken into account, this swap was always going to be hard to justify as a net gain for biodiversity. It becomes even less viable if the analysis is extended to account for the potential negative impacts on aquatic biodiversity that would have likely occurred downstream should the irrigation scheme have been implemented as planned. Media accounts from the time when initial planning approval was sought indicate that this risk was identified to DOC management by their aquatic experts, but that their analysis was excluded from the overall neutral DOC submission on the irrigation proposal. However, there is another much greater concern with this proposed land-swap. In particular, this swap was never motivated primarily by a desire to increase the protection of New Zealand’s biodiversity – first and foremost it was designed to facilitate the building of a dam. That is both this swap, and the subsequent appeal, were primarily initiated to facilitate the removal of an obstacle to the Government’s primary production growth strategy. This is precisely where the use of land swaps is a potential mine field for the Department of Conservation, which is required to hold in tension both its statutory responsibilities for the protection and management of New Zealand’s biodiversity, and the pressure that it comes under from its political masters to bend the rules to facilitate goals and activities that are sometimes incompatible with conservation. Looking south across the Denniston Plateau towards Mount William from near Cypress Creek; the site for which Bathurst Resources has consent lies approximately 4 km to the west of this high point. Credit/John Leathwick. Parallels to this rule-bending can also be found in another ‘exchange’ agreed to by the Department of Conservation in May 2013 to facilitate the granting to Bathurst Resources of a consent for their proposed mine on the Denniston Plateau. In a speech to the mining industry in August 2013, the then Director-General of DOC, Al Morrison, promoted this agreement by arguing that the losses on Denniston amounted to only 106 hectares of land, but that in return the Department would receive $21.9 million to fund the management of predators across 25,000 ha of forest in the Heaphy River. Here again, a simple area-based comparison was used to portray this arrangement as a biodiversity gain. By contrast, an assessment of this exchange based on the contributions of these two areas to the achievement of our national conservation goals would have viewed this exchange quite differently. 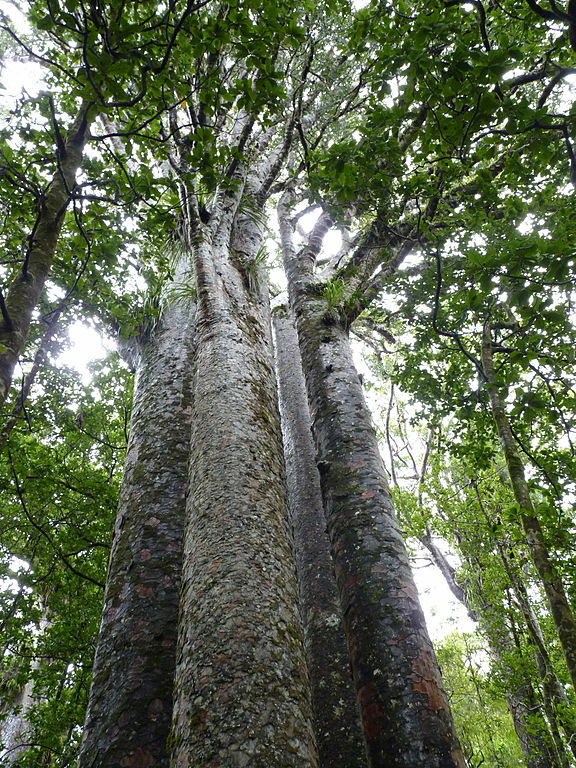 It would have required consideration of (i) the extreme rarity of the surviving, unmodified parts of the Buller Coal Plateau, with their well-documented distinctive environments and species, including some that are found nowhere else in New Zealand, and (ii) the already high level of representation on Public Conservation Land of the much more widespread podocarp-beech forests of the Heaphy River that were to be managed with the money received from Bathurst Resources. It should also be noted that these Heaphy River forests were already receiving a reasonably high intensity of management from DOC’s core biodiversity budget prior to the signing of this compensation agreement. Viewed through this lens, it is again hard to construe this arrangement as anything other than one that directly undermines our ability to meet our national biodiversity goals. In particular, it enables a private commercial company to carry out activities that will cause irreversible damage to a site supporting highly distinctive and irreplaceable biodiversity features that are already under high levels of threat elsewhere across their (very limited) geographic range. Further, it achieves this by requiring the mining company to contribute funds to support the management of a widespread ecosystem that is already well-protected and well-managed – an ecosystem that contains very few if any of the irreplaceable features and species that will inevitably be lost on the Denniston Plateau, and which is therefore incapable of making up the gaps in representation of the ecosystems and species that will be lost through mining. Not surprisingly, conservation groups viewed this arrangement with alarm and argued that this area should be protected for future generations, rather than being opened up for short-term commercial gain by a predominantly offshore-owned mining company. Unfortunately, they were unable to sway the Environment Court, which was no doubt persuaded at least in part by DOC’s willingness to grant this access arrangement to allow mining to proceed. Lewis River – Podocarp-beech forests at the junction of the Lewis and Heaphy Rivers to be managed under the Denniston compensation agreement – the profound differences in ecosystem character compared to Denniston are clearly apparent. Credit/John Leathwick. The two examples outlined by the Parliamentary Commissioner for the Environment demonstrate that in the right circumstance, land-swaps can deliver genuine progress towards achieving our biodiversity goals by increasing the representation of ecosystems and/or species that are rare and/or poorly represented on public conservation land. Note, however, that under the Conservation Act, these can at present only involve sites classified as stewardship land. By contrast, the Ruataniwha and Denniston examples expose a much more negative aspect of biodiversity trading – the construction of arguments for net biodiversity benefit that, while superficially attractive, are primarily designed to provide an illusion of gain to facilitate private access to public conservation lands to benefit the financial well-being of private individuals or companies. In one of these, the exchange is at best neutral but more likely negative, once downstream impacts are taken into account – the second facilitates the relinquishment of land with very high (irreplaceable) biodiversity values for mining, a land-use that makes this loss irreversible. Does that mean DOC is failing in its responsibilities to deliver on the broad goals of the Conservation Act? At one level, it is tempting to reach that conclusion. However, my own experience of the Public Service, coupled with commentary from others, casts these events in a slightly different light. In short, a number of long-term observers of the Public Service argue that the traditional model of strict independence from the political process has gradually been eroded away over the last two to three decades. When it comes to these recent DOC transactions, this appears to have resulted in a significant blurring of the boundary lines between ‘DOC the Department’ giving free and frank advice based on its expertise in biodiversity management, and ‘DOC the facilitator’ whose actions conform to Governmental demands for direct support of its development and wealth creation agendas – even at the expense of the Department’s primary role as the custodian of New Zealand’s biodiversity. And this conformity is understandable when anything less than full compliance with ministerial demands potentially risks bringing down the wrath of Government, with the spectre of further budget cuts. While the cases outlined above might tempt some to place all land-swaps or compensation arrangements off limits, clearly some legitimate opportunities for biodiversity gains could be lost if all trading was ruled out. Some modification of the Conservation Act to allow greater freedom for land exchanges might be desirable, but it must allow only those swaps that provide genuine biodiversity gains. In addition, any such exchanges should be required to undergo robust evaluation within an evidence based, conservation science framework designed around our high-level biodiversity goals. Given the degree to which the Department’s reputation appears to have been compromised on at least two of its recent such arrangements, responsibilities for evaluation and final approval should probably be handed to a body that has a strong statutory independence from Government interference, such as the Parliamentary Commissioner for the Environment. Dr John Leathwick has about 40 years experience in conservation science, mostly exploring the crossovers between information tools and conservation management. He has worked for the former NZ Forest Service, Landcare Research, NIWA and DOC, but is currently self-employed mostly doing conservation planning work with Regional Councils. Another important consideration in land swaps is to weigh up the risk that the biodiversity on the private portion will actually be destroyed. For example, if the land for swap were covenanted under a QEII covenant, or the Council’s district plan prevented clearing of reverting scrubland, that would be a factor which reduced the justification for a swap. There will be other cases where land swaps evaluated on the basis suggested by John will be advantageous to both parties – after all, a lot of DOC boundaries are historical rather than ecologically based. The view that biodiversity can only be protected on land within DOC’s control is clearly flawed, and creates its own ecosystem fragmentation challenges. .